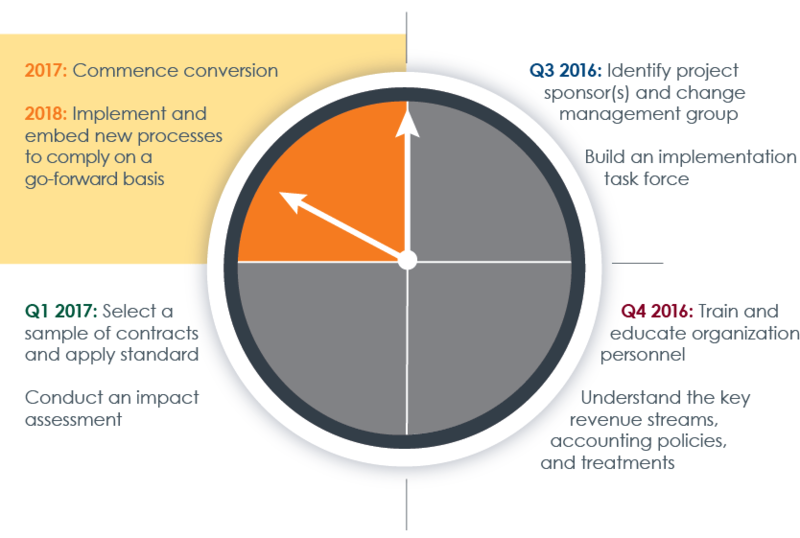 In the final installment of CohnReznick’s four-part informational series aimed at helping companies prepare for the new revenue recognition standard, we discuss steps 7 and 8 of the transition timeline, which we recommend commencing in 2017. Steps 7 and 8 focus on starting the conversion and making changes to the processes, systems, and controls that are likely to be needed in order to comply with the new standard on a go-forward basis. Once all of the groundwork (i.e., steps 1 – 7 of the transition timeline) has been laid, conversion can begin. At this point, the company should determine which adoption method (i.e., full retrospective approach or modified retrospective approach) it will proceed with if this was not addressed at the outset of the project. From here, the company will map all of the accounting policy differences noted during the impact assessment and begin to establish new policies and processes sufficient to address those gaps while also dealing with various systems impacts. At this time, the company should also consider a “dual-GAAP approach.” By monitoring the impacts to revenue recognition the task force and other members of the implementation team will be better prepared to inform key stakeholders of the types of reporting differences the adoption of the new standard is having in real time. The results of the dual-GAAP approach should be discussed with the company’s external auditors as well as across functions within the organization. In this final step, the organization will set about institutionalizing its new compliance processes, collecting and converting data in accordance with the new standard on a going-forward basis. The company should test any new processes and controls (both manual and systems-based) that result from the conversion process to ensure both the accuracy and reliability of the new revenue information. Management should begin drafting the new enhanced disclosure requirements while ensuring data capture is sufficient to comply with all aspects of the new standard. Management should also consider the needs for disclosure during its transition efforts as well as from a going-forward perspective. Clearly, implementation of the new standard is a considerable undertaking. With the clock ticking on the deadline for adoption, it is imperative companies take a pragmatic approach to capitalize on the time remaining and make sure they are fully prepared. CohnReznick is committed to providing the tools and information CFOs and financial executives need to successfully lead their organizations in the implementation process. To receive the latest updates and industry-specific information, bookmark our revenue recognition resource webpage and look for announcements of upcoming webinars. Return to Revenue Recognition Series page.